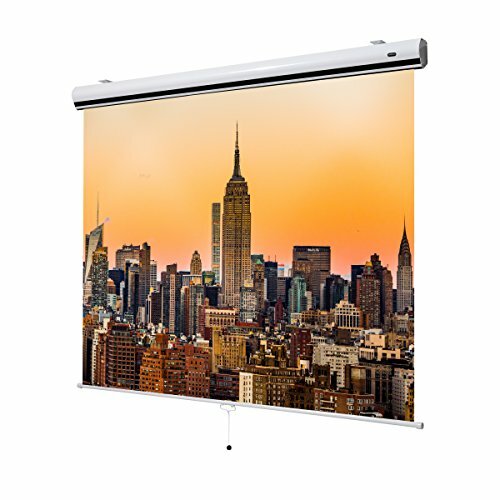 The celexon 137“ manual pull down projector screen Manual Expert has a lightweight house made of aluminium, adjustable mounting brackets and holds a high quality fiberglass fabric. The projector screen is suitable for displaying high-definition content in a wide range of room temperatures. The celexon Manual Expert screen is completely flat and offers highest quality workmanship. It has a wide range of application, for e.g. in classrooms or auditoriums. With the soft-return mechanism the screen is rolled up automatically in the Casing in one second. Just pull the drop bar about 5cm down and let it go.